KNAC.COM - News - 2015 MONSTERS OF ROCK CRUISE Cabins On Sale Today! 2015 MONSTERS OF ROCK CRUISE Cabins On Sale Today! Thank you for waiting patiently for this day... and it is finally here! The 2015 Monsters Of Rock Cruise goes on sale today at 3 pm Eastern / 12 Noon Pacific! Get ready to book your cabin for the biggest and baddest party on board the incredible MSC Divina…we want YOU there! If you haven’t already, check out our line-up, itinerary, pricing and get the full details NOW at www.MonstersOfRockCruise.com. Beginning today at 3 pm Eastern visit our website at www.MonstersOfRockCruise.com and click on the “BOOK NOW” link at the top of the page. If you prefer to speak with a representative, please call our Reservation and Guest Services line Monday - Friday at (855) 505-6672 or (954) 417-6264 between the hours of 12 Noon to 6:30 pm Eastern. PLEASE NOTE THAT DUE TO ANTICIPATED HIGH CALL VOLUME, WE ENCOURAGE YOU TO BOOK ONLINE, IF POSSIBLE. THIS WILL EXPEDITE THE BOOKING PROCESS AND LIMIT YOUR WAIT TIME. Choose the type of cabin you would like: Interior, Oceanview, Obstructed Balcony, or Balcony. Please note, all Silver VIP, Aurea and Yacht Club suites are sold out. Complete the reservation process by providing legal names (as they appear on your passport), dates of birth, contact information and payment. In order to receive a booking number and cabin number, you must complete EVERY step in the process. Once all the steps are completed, you will receive a temporary confirmation number. This will be your confirmation number until we have assigned you a cabin and completed your booking with MSC. Once completed, your reservation is secure. Please remember that final confirmation emails with booking numbers and cabin numbers may take up to 5 weeks to process due to high demand. Once we have applied your payment we will send you a final confirmation email that includes your booking number and cabin number (replacing your temporary confirmation number). Due to the high volume of bookings, this process may take up to 5 weeks to complete. However, your temporary confirmation number GUARANTEES you a spot on the Monsters Of Rock Cruise. The sooner you book, the better your cabin. Single (1), Triple (3) and Quad (4) cabins are available as well, so be sure to check out our website for pricing details. Mandatory Government taxes, fees and prepaid gratuities of $220 per person are additional and will be automatically added to your reservation. In an effort to reduce costs even further for our Monsters Of Rock family, we are once again offering a Paid in Full Discount for the 2015 cruise. When booking your cabin, you may select the “Paid in Full” option and receive a 5% discount off your base cabin fare (not including taxes, fees and gratuities). Please note that full payment must be received within 72 business hours of booking your cruise to receive this offer. The entire cabin must be paid in full. No exceptions will be made. This offer is subject to capacity control and may be terminated at any time. If you choose not to pay in full, you may also opt to make payments and can reserve your place with a deposit of only $250 per person with the balance spread out over 3 additional payments. 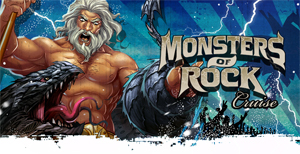 Please be sure to read the Terms and Conditions so you are aware of our cancellation, name change and all other Monsters of Rock Cruise policies at: http://monstersofrockcruise.com/terms-conditions/. Due to the nature of the event we have a strict cancellation policy. We HIGHLY recommend that passengers consider purchasing travel insurance as it is NOT included in the cost of your cruise. Please contact us at reservations@MonstersOfRockCruise.com if you have any questions. Once again, we are ready to ROCK aboard the biggest party to ever hit the high seas…The Monsters Of Rock Cruise! Don’t delay and miss out…we sell out fast! It would be a shame to sail without you!